Patterned after the factory Hobie® 16 jib sail, spec-ed by Murrays and crafted by Hyde Sails UK. With over 50 years of sail making experience, Hyde knows how to pack their sails with features and value. Hyde starts with Challenge 6.03-oz. Dacron®, that is computer-controlled laser cut. The panels and patches are assembled with a special two sided adhesive tape before they are machine stitched. The sail is then “finished” by adding any boards, rings, hanks etc. The last step is quality control, the QC specialists use a check sheet as they go over each sail for flaws or errors and make sure the original specifications have been met before the Murrays/Hyde Sails label is attached. Each sail includes a viewing and two tell-tale windows. The base price is for a solid color 6.0-oz main sail, multicolored sails are also available for an additional charge. Available colors include Dark Blue, Medium Blue, Flo Orange, Red, Pink, Yellow, Flo Yellow, Turquoise Green, Black, Grey and White. We do our best to keep white sails in stock, but there can be a delivery delay during peak season. Colored sails are made to order and will take several weeks to produce. Call for availability and build times. Designed for use with the Hobie factory batten set (not included). Color Disclaimer: *The colors shown below are just a representation of the color options. Due to inaccuracies with the camera and your screen the colors you see are not a perfect representation. 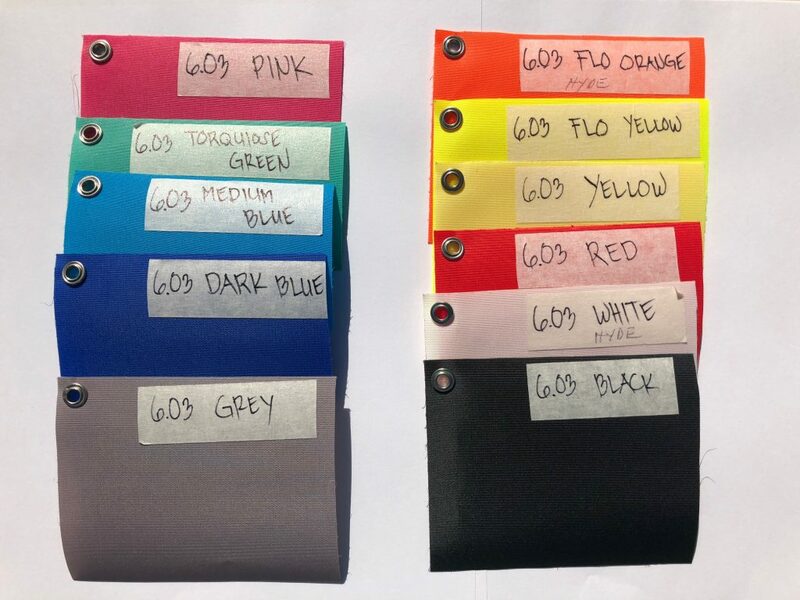 Many sail manufacturers will not show their colors due to this issue, but we wanted to give you an idea of what they look like. We will not be held responsible for differences between their appearance in this picture and their actual color.